Harvest Moon Classic returns Oct 20-22, 2017 for another great party... uh... dog show with Del Valle Dog Club of Livermore, Skyline Dog Fanciers of San Mateo County, and specialties galore! Betty-Anne Stenmark showchaired the first Skyline shows and 70 Harvest Moon Classics, not to mention how every many Parent Club Nationals in-between. 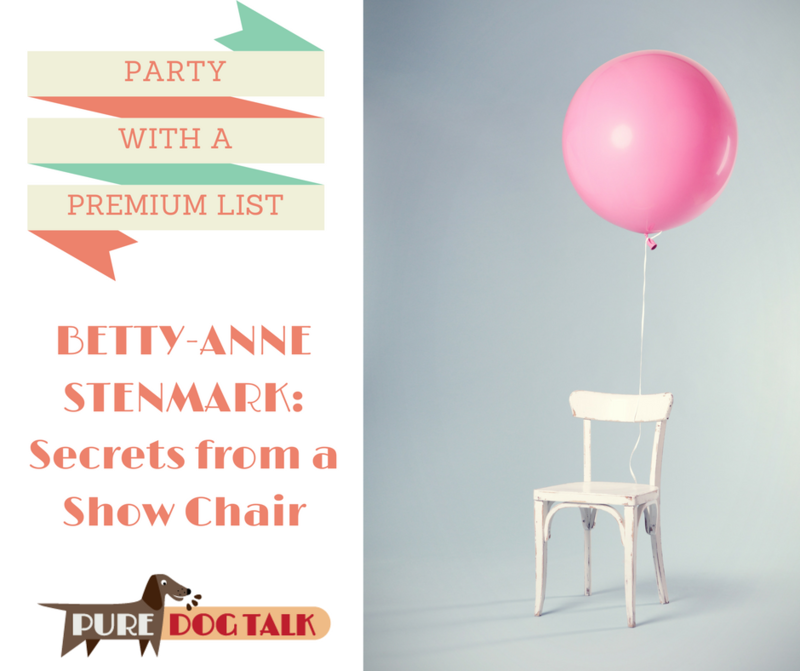 Listen to Episode #38 of Pure Dog Talk as Betty-Anne Stenmark shares lessons learned of how to throw a party with a premium list; a dog show that all enjoy and attracts specialty clubs to party too. In 1990, in response to one of the first Animal Rights fights the Responsible Dog Owners of San Mateo was formed by Betty-Anne Stenmark and other local fanciers. Later to become Skyline Dog Fanciers of San Mateo County. Each committee chair should mentor an assistant, just in case. Be positive and a good host with exhibitors: Think "Sure we can help you" or "Give me a minute to think what we can do for you". Don't micromanage as showchair. Don't answer questions that should be answered by other committee chairs. Specialties are the KEY to growing a show. Master Specialty Package - a "how-to" for the specialty clubs - AKC apps, parking, electrical, hotels, entry gates, maps, dates and deadlines. Club Members be there to support the specialty clubs and help. Was there enough shade? Ask the judges if they would suggest an improvement or change? Ask the specialty clubs if they felt supported by the All-Breed Club. Consider rotation of jobs for the next year so members have the opportunity to do something different and have time to learn. If exhibitors find that club members or the dog show is unfriendly or a holy-than-thou-this-is-the-way-we-have-always-done-it attitude, why would anyone want to join your club? Your show is your opportunity to be the party host! Be fun! Be gracious! Everyone is a volunteer. Power trips or possessive, protective behavior of the club or members need to be addressed. And when a guest attends your meeting... welcome them like a guest at your party.